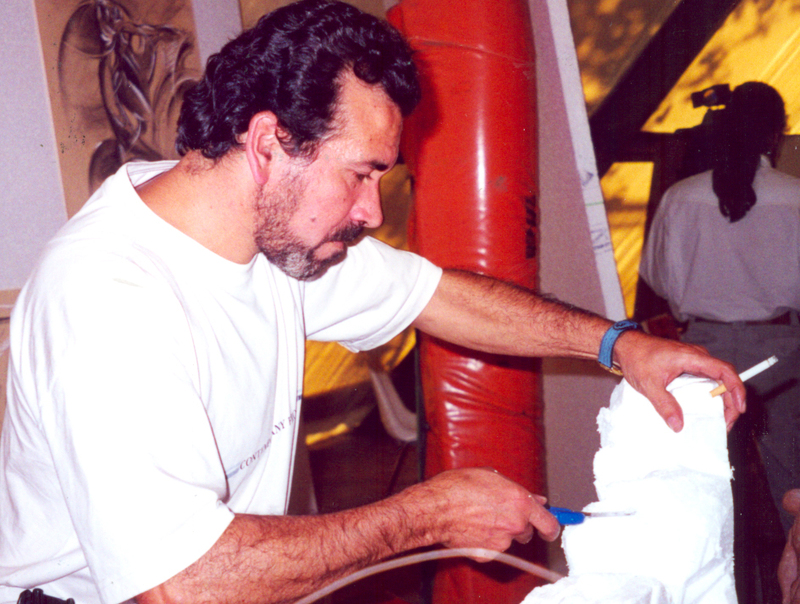 The painter and sculptor Ángel Calvente was born in Andújar, Jaén (1956), arriving in Andorran lands as a child. He is practically considered a self-taught person. He began his artistic studies in the classes of Professor Duarte in Andorra, added the advice of the painter Jaume Saumell, in the Barcelonian academy of Joaquín Camps and continued his training in the school of arts and crafts of Granada. Ángel was a member and co-founder of the Andorran Artists Association “La Xarranca”. He has been a member of juries of several national and international organizations. 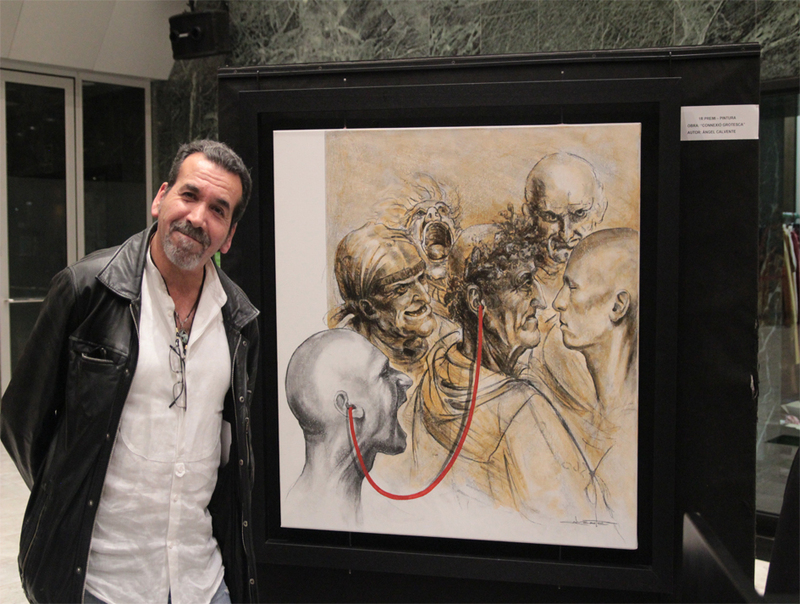 The artist also dedicated a decade teaching painting and sculpture in Andorra la Vella. He won several national and international sculpture prizes. 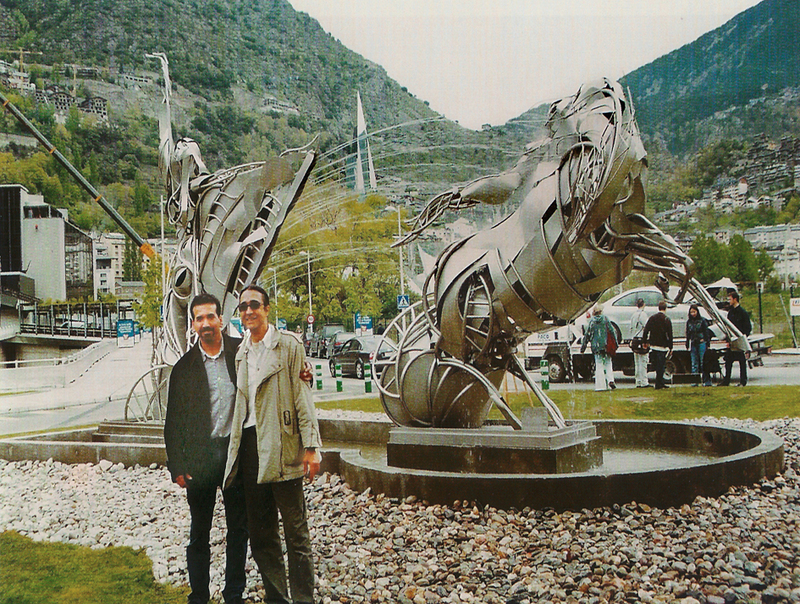 Likewise, he created a large number of urban sculptures in different parks, squares and roundabouts in Andorra. One of the most monumental works is “Calidea and the Dama de gel”, which he made together with his friend and artist Philip Lavaill, in Escaldes-Engorday. Represented Andorra in the international ice sculpture competition in Quebec (Canada), and participated in the “International Colloquium of Sculptures” in China. In northern China, in the city of Changchun, he created the monumental sculptures in bronze, “The Link,” and a year later, “Reflections on War,” which are part of public sculptural parks in that city. He made different paintings and decorations of a Sanctuary, as well as a mural of 40m² for the museum “La Casa de la forge”, together with numerous bas-reliefs and sculptures, always in Andorra. He worked tirelessly for many commissioned works, mainly in the specialty of the portrait, which provided the required exercise that requires knowing the interior of the person to be portrayed, and the gestures of the features of each face. This long examination, contributed to the concept of his work, a clear humanistic tendency, which is reflected in all his works. For more than 25 years Calvente has been fully dedicated to his work, and throughout his career, the artist inaugurated more than 30 individual exhibitions, with great public success. His works of art have been acquired by private collectors in Andorra, England, Brazil, France, Spain, Chile, Portugal, Quebec, Montreal, Brussels, California and China. 2015 Design, decoration and realization of LA CASA DE LA FORJA in Bixessarri. 2012 Exhibition RESURGIR, in the Espacio 29 gallery. 2008 Design and creation of a Sanctuary inspired by Baroque Gothic, altarpiece, stained glass, paintings and decoration. Baroque Gothic door of 40 Mc, with sculptures and stained glass windows. 2003 Guest artist exhibition “CIMS DEL ARTE”, Montpellier (France). 2000 Exhibition in the Arte Azul Café Room. Headquarters of Urgell (Lleida). HUMANOS Exhibition. Sociocultural and Sports Complex Hall of Encamp. 1993 Common Room of Escaldes: MOVIMIENTO-ESPACIOS. 1992 Exhibition PERCEPTION OF A TIME. Common Room of Encamp. 1982- 1992 Different exhibitions in Andorra (Escaldes, Encamp and Andorra La Vella), as well as in Spain (Balaguer, Borges Blanques -Lleida). CONNECTION GROTESCA, Tribute to Leonardo da Vinci. Andorra. 2.007 1st PRIZE International Bronze Public Sculpture Competition, HIJOS DE LA TIERRA, for the town of Encamp, Rotonda del Prat del Hermano. Exhibition in the gallery of the Changchun China hotel. Bronze sculpture in permanent exhibition REFLECTIONS ON THE WAR. 2.007 International Sculpture Symposium, China. Topic: PEACE, FRIENDSHIP, SPRING. 2.007 1st PRIZE International Competition of monumental public sculpture in bronze, with the sculpture LINKS, plaza de la fraternidad. Sant Julià de Lòria (Andorra). 2003 Seventh Edition of the International Ice Sculpture Contest of the Pas de la Casa. 1982 and 83 Participation in the Plastic Arts Competition of the Comú de Escaldes-Engordany. 2012 Tribute to José Rizal: bronze sculpture in the Central Park of Andorra la Vella. 2.006 Design and realization 4,000 mc of gardens, “THE GARDEN OF THE SYMBOLS” with 7 sets of monumental sculptures and water games, Juverri, Sant Julià de Lòria. Work co-performed with the sculptor Philip Lavaill. 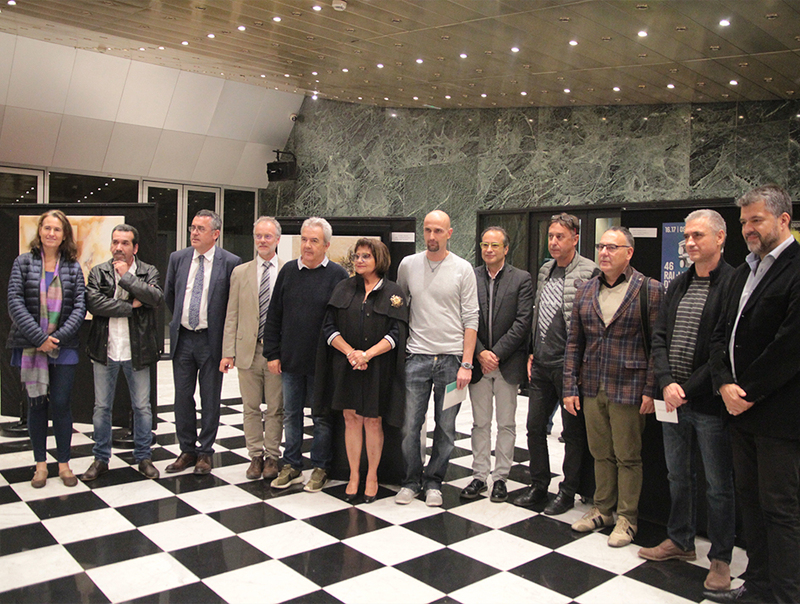 Patronage of the Multinational Astral Group, and donation of the artists. 2001 Mural Painting of 36 m² for the side facade of the building La Fuente del Común de Ordino. From 1998 to 2003 Realization of the Art Facade: Giant Advent Calendar. Common of Escaldes. 1995 Exterior mural of 450 MC: VISUAL SPACES. Sports Complex of Encamp. 1992 Exterior mural in Andorra la Vella by Banca Mora (250 MC). 2014 Collective exhibition with the artists José Mª de David, Sorensen and Vasarely, in the El ille de Arte gallery, El ille sur Sorgue (France). 2013 traveling collective, help with essays assignments Venice, Italy. Traveling collective, Latvia, Lithuania, Strasbourg, Lisbon. 2012 Collective Symposium Art Field, Andorra. From 1985 to 2000 Summer Salon La Valireta Hall in Encamp, Andorra. 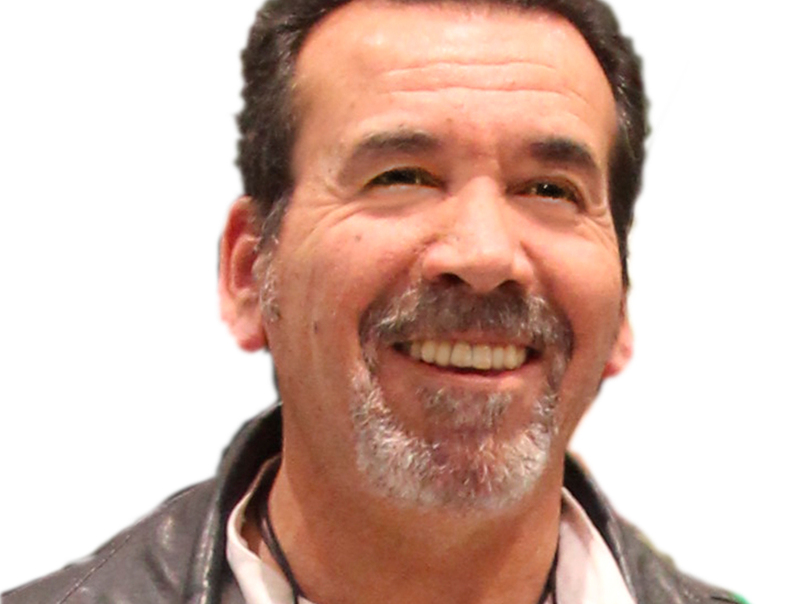 From 1998 to 2000 Coordinator of Brossart, Andorra. 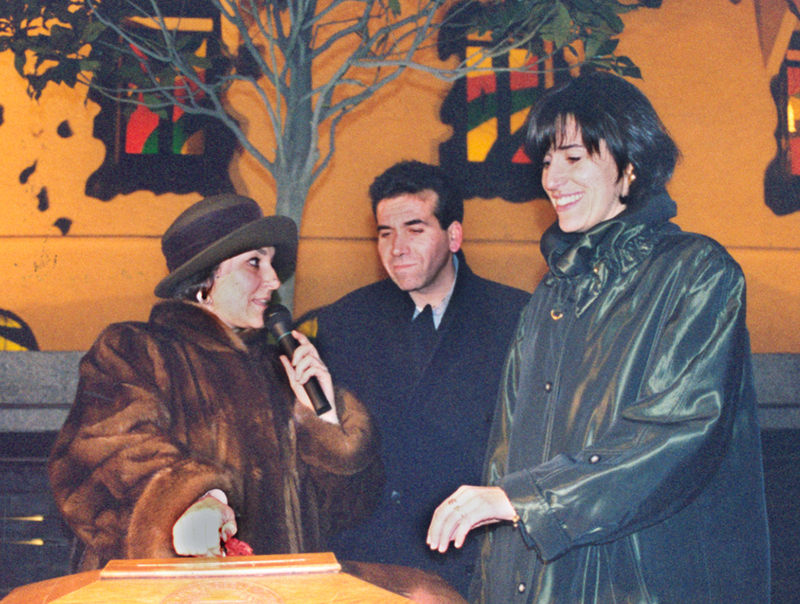 From 1983 to 2014 Participation in different exhibitions in Andorra (Comunes de Escaldes-Engordany, Encamp and Pas de La Casa, La Massana, Canillo and Andorra La Vella. ), As well as in Spain (Olot, Girona, Tortosa, Lleida, Balaguer, Tarragona, Mataró, Hospitalet de Barcelona, ​​Peñíscola, Barcelona).